Tomorrow is a new month, which means two things: (1) we’re soooo close to fall!!! and (2) it’s time for a new cookie recipe! I look forward to making a new cookie recipe for you guys every month. I even try new cookies any chance I get to help inspire my next recipe. See what sacrifices I make for you guys?! Today’s recipe was inspired by a cookie recipe I had at a Mexican restaurant. Yup, a toffee cookie at a Mexican spot. Did it make sense? Not so much. But was it good? To my surprise, it was!! I’ve lost touch with my obsession for toffee. It was something that I craved as a kid. I mean, those Werther’s hard candies were one of my favorite things on the planet! Anyone else?! But I soon got over it as my chocolate and peanut butter obsessions grew. So this cookie didn’t have much of a chance. After one bite of this cookie, oh man, was I wrong! The toffee added another layer of chew to the cookie, but with a slight crunch, that was simply perfect. That’s why I was so shocked by it – it overcame quite the obstacle to make it on my list of favorite cookies! And so that’s why I am sharing a similar recipe with y’all today. Say hello to my Sea Salt Toffee Chocolate Chip Cookies! For my take on this cookie, I added a little gourmet flair – flaky sea salt. Sea salt helps balance out the extra sweetness from the toffee and enhances the flavor of the chocolate. In other words, it’s a miracle worker. In the cookies, you’ll notice that there are flecks of chocolate in there but it doesn’t look like a chocolate chip. That’s not exactly on purpose. This recipe calls for mini chocolate chips – which I thought I had in my pantry. Nope, just regular chocolate chips. So I decided to chop up my regular chocolate chips into tiny pieces. Worked like a charm! In fact, I almost liked it a little better because each bite had the perfect amount of chocolate in it. So if you’re in the same situation, pulse those chocolate chips in a food processor and you’ll be all set. There’s another unique ingredient in these cookies that only make them better: oatmeal. Oats are chopped into a fine flour and then used to add a little texture to the dough. You wouldn’t know it was there if you didn’t know the recipe, but it really does help make these cookies extra chewy. Make sure you chill the dough for a couple hours before you bake them. If you simply cook them at room temperature, they will spread into thin pancakes. Because these cookies have a little more baking soda than normal, they will spread more than normal, so I recommend placing only 12 cookies per baking sheet if you want them to stay perfectly round. Also, for this reason, I recommend keep the dough in a perfect ball when you place them in the oven to bake. This will keep them from spreading too much. Don’t over mix the batter or else the cookies will turn out cakey. You want they to be super chewy! 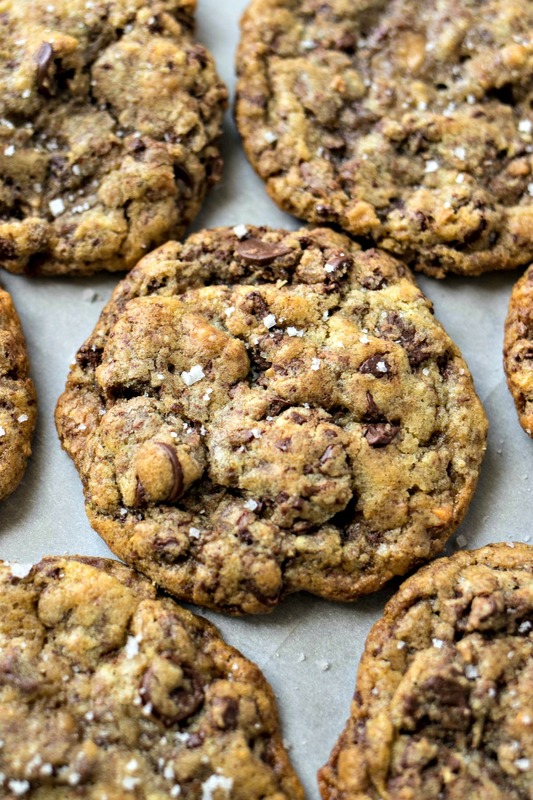 There you have it, people – Sea Salt Toffee Chocolate Chip Cookies! If you love this recipe, make sure to share with your friends on social media! First, place oats in food processor so they become fine. Place into a medium bowl with flour, baking soda, salt, and ground cinnamon. Stir together. Set aside. Place butter and sugars into a large bowl of a stand mixer (or just a large bowl and a hand mixer) and beat together until light and fluffy (about 2 minutes). Add vanilla and 1 egg and mix until combined. Add other egg and mix just until combined. Add all dry ingredients to butter mixture and beat just until combined. Do not over-mix! Using a spatula, fold in chocolate chips and toffee pieces until evenly distributed. Scoop dough into 2 tablespoon-portions and place on a large baking sheet with parchment paper. Place in fridge for 1 hour to chill before baking. Preheat oven to 350 degrees. Remove cookie dough from fridge and place onto baking sheets about 2 inches apart. Be careful - these cookies will spread! Place cookies into preheated oven for 11-13 minutes, or until the edges are nice and crispy. I only bake one sheet at a time and put others into the fridge as they wait to be baked. Remove from oven and cool on baking sheet for 5 minutes and then transfer to cookie sheet to continue cooling. While they cool, sprinkle a little flaky sea salt over the cookies. Eat immediately or store them in a storage container for up to 4 days. Are these able to be chilled over night or do you only recommend an hour in the fridge before baking? You can chill overnight. The one hour is a minimum. Hello! I wanted to make these for the weekend but was wondering if I could make the dough and freeze half of it for next week. Do you have any freezing recommendations? We have made these twice now (today will be our third!) and they are our new favorite chocolate chip cookies! Aw yay! So glad to hear that you love them! When I freeze them, I make sure to form them into balls first. That way, I can just place them on a baking sheet and bake in preheated oven right from the freezer. I think I add another minute or two to the baking time. But other than that, no other modifications needed! Great cookie. The only thing I changed was I put the cookie dough in the fridge before putting them on the cookie sheet. Everyone loved them! Made these cookies for my coworkers and my friend…so chewy and soft. The sea salt is the PERFECT balance for the sweet cookie. Oh man, it was so hard not to eat all of these! Your recipes have easily become my “go-to”! I really appreciate all the tips– they are so helpful and make a WORLD of a difference! Hi Sonia! Thanks so much for your sweet comment and for being a regular visitor to the blog. I am so glad you love the recipe and the tips! Hi! Do you think these could be made as a bar cookie? 9×13? I’d so how long would you she – 30 min? Thank you! Oooo good idea! I definitely think so. But I’m not sure how big. I think 9×13 would work but if it’s spreading too thin, switch to 9×9. It just depends on how thin you want them. I would think between 20-30 mins in a 350 degree oven would be enough but just keep an eye on them. If you’re using a dark pan, lower the heat to 325 degrees so the edges don’t burn. Hope that helps! Let me know how they turn out! Good question! I actually used chopped Heath Bar Bits (baking section of the grocery) but chopped Werthers would probably give a more potent toffee flavor. I should try that next time! But definitely use hard toffee. I love chocolate chip cookies, but have never tried sea salt toffee cookies. These look so good though! These cookies look so good…extra soft and chewy! I’m a CPA too…by day and night! This is such a unique combination but these cookies look amazing! My daughter and I love to bake cookies, but we normally just use dough already made. This looks like it would be a lot of fun. It totally would! I love making cookies with my nieces because they can help roll the dough. It’s a fun activity and helps the cookies get done faster! It felt like fall today. It was so chilly and people were out wearing hoodies and sweaters! These look delicious. I may not like the weather turning cooler but I do love cookies 🙂 I look forward to your cookie recipes! Thanks Jolina!! I am so glad you like the cookie recipes! These are perfect for fall! I love sea salt and sweetness paired together. Cannot. Get. Over. These. Cookies. They seriously look SO amazing- that sea salt is the perfect touch! Thanks Karly!! I love adding sea salt to everything! It really brings out the flavor! Yum! Adding salt to cookies adds such a yummy twist, I love it. I’ll have to make some of these soon! Yum, yum! These beautiful Sea Salt Toffee Chocolate Chip Cookies look fabulously scrumptious! I love the ingredients and everything about this recipe – it’s a keeper. That’s so nice thank you! These cookies look too good to be true! I am going to pin these so I can make them at home. Thanks for the recipe. OMG! This look absolutely amazing! I am totally salivating over here! These look amazing…I just pinned them! That’s what I love most about baking! If you can measure the ingredients, then it’s gonna come out great!